Summer is here and you are looking for ways to spend more time in the outdoors with your dog. Camping with your dog is a great way to do that. It’s like taking your life and moving it outside. Your dog will love exploring all the new sights and smells, it will help clear your mind, and it can improve your bond with your pet. There are several different ways you can camp and each one suits a different “comfort” level with the outdoors. For example, taking your dog glamping is great for beginners or those who want to experience nature without living it in full-time for a couple days. Backpacking with your dog is for adventure seekers that want to fully immerse themselves in the experience. Glamping, or “glamorous camping”, is an easy way to get into the outdoors without sacrificing every luxury. It’s considered the least “camping” way of camping. When you go glamping, you are almost always guaranteed not to sleep in the dirt. The rest of the details can vary quite a bit though. Glamping options can include caves, “eco-pods”, tepees, safari or hunting tents, tree houses, yurts, camper vans, and small cabins. Basically, glamping is done in a non-traditional accommodation and, while they usually have amenities, they’ll definitely require more “roughing it” than staying home or at a hotel. A glamping site may have running water, may have solid walls, may have an inside toilet, may have a private shower, may come stocked with plates, silverware, pots and pans, may have a cooking method (microwave or stove), may have fridge, may have bed with mattress, may just have hard surface you have to place a sleeping pad on, may have some source of heat (usually do), and may have other amenities on site. 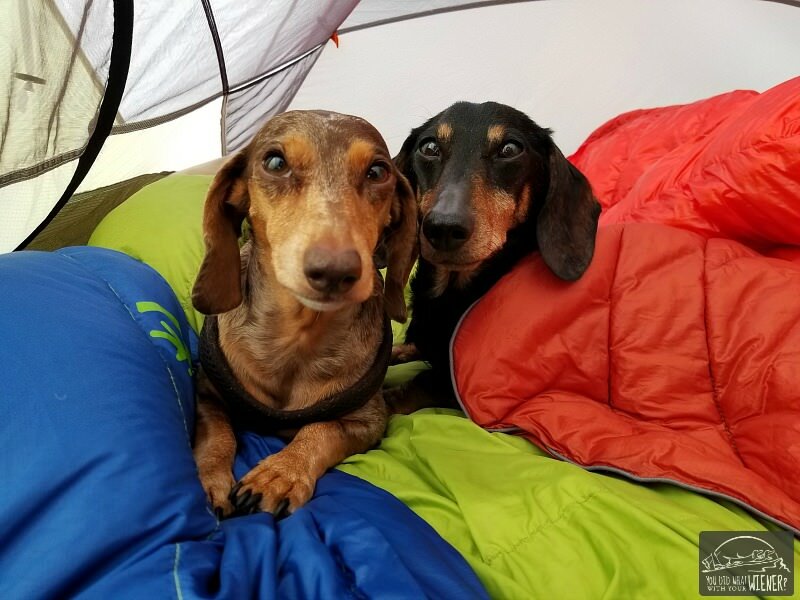 There are several dog-friendly glamping accommodations in Washington State including vintage trailers on the ocean or yurts, cabins and huts at State Parks. The premise of car camping is that you can take whatever will fit in your car. That means you can bring many comforts of home with you. Although it’s best not to, it also means you can forget something. You can always drive to the nearest store to pick something up or quickly change your mind and head for home. Car camping can be done two ways – counting as ways #3 and #4. The first way is to drive to the campsite, unload all of your gear, and sleep in your vehicle. The advantage of doing that is you don’t have to worry about your campsite being perfectly level, it raining on you in the middle of the night, or boogeymen trying to break into your tent. The drawbacks of this method are that it’s impossible if your car is not big enough to stretch out in and the windows will steam up if you don’t leave them cracked or cover then with window screens. The other way to “car camp” is to drive everything you want to bring to the campsite and sleep in a tent. The advantages of doing that is you feel more like you’re really camping and you get to breathe fresh air all night. Drawbacks of sleeping in a tent are that high winds and rain can make a lot of noise and keep you up, if you don’t have the proper rainfly on your tent you can get wet, and you’ll need to find a flattish spot with no rocks or roots to pitch your tent. 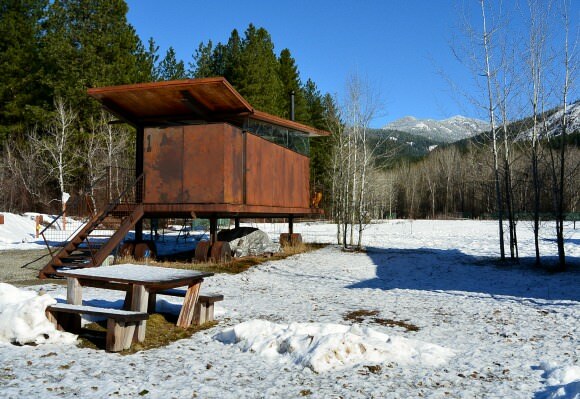 As with glamping, campground amenities can vary. Some are very rustic, only providing a pit toilet (but no running water or garbage service). Some have showers and wi-fi. Usually, the more rustic feeling the campsite, the less amenities it will have. 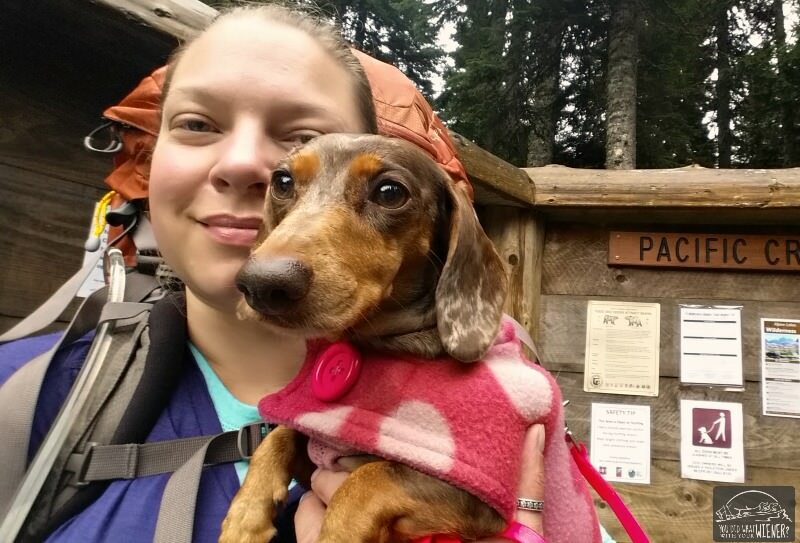 There are several places you can car camp with your dog ranging from dispersed camping on Forest Service property (this is for Washington – be sure to check regulations in your own state; this method is free) to Forest Service or State Park campgrounds to private campgrounds like KOA. 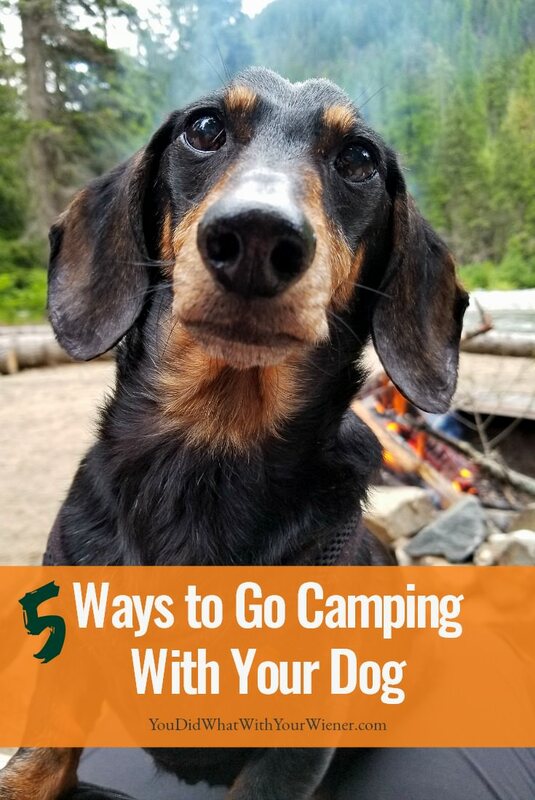 Whether you choose to sleep in your car or in your tent, make sure you have these must-have camping items for your dog. This could also be considered a type of car camping because you are driving everything you need to the campsite. However, instead of sleeping in your vehicle or a tent you will basically be sleeping in a mobile tiny house. I put this way of camping in the #4 slot so I could explain car camping before it but it’s definitely falls somewhere near glamping and before either way of car camping on the comfort spectrum. However, it’s more challenging than those other three ways in some respects. The big advantage of spending the night in an RV or trailer is that it’s mostly a smaller version of your house with some version of electricity and plumbing. Also, unlike glamping, you own the “building” so you can set it up how you want before you leave home. Drawbacks include that you have to own one first – which can be costly – you have to be comfortable driving a big vehicle or pulling a big trailer, and you are limited to campgrounds that have parking spots big enough for it. This is the most adventurous way to camp of the five. It takes a lot of preparation and know-how. You load everything you need to survive in the woods for a couple days into something the size of a duffel bag and head out in to the woods. I would never suggest that somebody’s first-ever camping trip is backpacking. However, if you have been camping a least a dozen times but crave more adventure, backpacking with your dog might be for you. Backpacking is usually done solo or in small groups. You must be confident in your ability and self-reliant because this method of camping comes with more risk. If something goes wrong you are not near a doctor and it is not easy to pack up and go home. In fact, sometimes it may be impossible if you are injured or it’s dark. I think the rewards, which include being more in touch with nature and offering a stronger bonding with your dog, are greater than the other types of camping though. A challenge when wanting to backpack with others is finding friends who have the same days off as you and who think schlepping a heavy bag of crap up a mountain is fun. If you want to go this route (and it’s probably a good plan if it’s your first backpacking trip), I suggest you join local hiking groups and tag along for someone else’s trip (I swear this is a normal thing among the hiking/backpacking crowd) or plan your own and invite others from the group along. If you are in Western Washington, two great groups for this are the Washington Hikers and Climbers Facebook group and the Pacific Northwest Hiking & Adventure Group on Meetup.com. No matter where you live though, there is probably a group like this. If you are an experienced camper and have been backpacking before, you might yearn to head out in the woods with your dog alone a’ la Cheryl Strayed from Wild. Personally, this is my favorite way to camp, although not the most common way I do it given the physical and time preparation needed. To me, backpacking boost my confidence and heightens my senses. On the trail, I have to be alert of my surroundings at all times and think critically. I’ve also noticed that the relationship I have with my dog is different after spending a few days alone in the woods with her. If you plan to head out on a backpacking trip alone too, I highly suggest investing in a satellite SOS messenger (affiliate link – I get a small commission, at no extra cost to you, if you purchase one). No matter which method you choose, I think camping with your dog is a must-do. If you haven’t done it yet, put it on your bucket list. Maybe you will decide it’s not for you but you won’t know until you try it. You might decide it’s the best thing you and your dog have ever done together. Now that I’ve been a few times this summer, I’m really considering a solo backpacking trip with Ruby. Thanks for this awesome post! Getting a doggie backpack is a good easy way to make the trip more fun for dogs. Apparently (some breeds more than others) dogs love having a job, even if it’s a completely unnecessary one. So if you let them carry their own water, food, and treats in the backpack, it’s more “fulfilling” for them. Your mileage may vary with this though, we never got past the “putting on the backpack” step with one of ours. He seemed perfectly ok with being a mooch. That is very true with big dogs. Less so with smaller dogs primarily because they can’t carry much for it to be useful anyway and/or it is not safe for their back (like my dogs – Dachshunds). I wish they could carry a pack though. It would be cute and I wouldn’t have to portage so much of their crap into the woods. Ha, ha. Camping with my dog is the BEST! So much freedom and we can see so many places – I don’t know why others don’t do it more! Thank you for sharing tips. I love camping with my dog in summer. Backpacking is my favorite because it is the most interesting way to make the trip more fun for both of us.